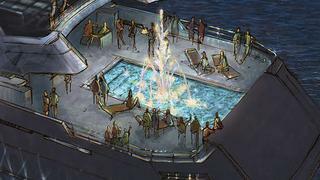 Advanced New Technologies (A-N-T) has several studies for lighted fountain installations, both in yacht pools and with extendible exterior piping that creates fountains off the stern. Stefano Pastrovich created a refit concept of a 91.4m ocean-going tug tuned into a private island. Unlike on the land, where creatives can create a suite of fountains to dance and sway on command, incorporating a even simple water features  such as a small fountain or a waterfall  aboard a yacht brings with it many challenges to consider. Historically, the biggest consideration was how to manage water on the boat. The movement of the boat itself creates a wave momentum in on-board pools that can become difficult to contain, even in the calmest of cruising conditions. For this reason, the easiest solution was to use the pool only when the yacht was docked or at anchor, with all guests ordered out so that the pool could be emptied or drained to half capacity before the yacht got underway. While this remains a common practice, most pools are now also designed with deep surrounding sumps that capture wayward water and return it via a circulator pump and/or a holding tank that stores the warm water between uses. Today the issue is not only about the wow factor, but about incorporating the amenities an owner might enjoy on land into his yacht. The typical solution is to create an infinity pool with a swim-against current feature. Location is critical  a large pool on an upper deck creates a weight issue that can interfere with the boats stability and centre of gravity. For this reason most pools are placed on a lower deck near the stern. However, here you must consider the shape of the hull. While an owner might request a depth of around five feet, a fast semi-displacement hull, for example, would mandate that the depth stay in the three to four foot range. The bigger the pool, the more water it will require, which adds weight to the vessel, and thus becomes a factor for the engines. We are careful with cutting-edge designs, says Laupman, whose firm is currently working on a 73m boat for which a large pool is an important feature. 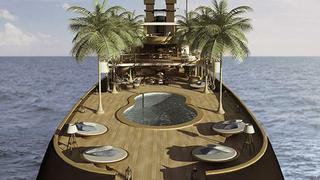 On the 73m project_ Omega, _the beach club floor was designed to be flush with the hatch that extends at the stern. The pool water is on the same level as the floor, which required some tricks with height due to the boats shallow draft.